As it stands, electric scooters are regulated more like mopeds and must have blinker lights under M.G.L. ch.90 §1E. Bird did not equip their scooters with blinkers. Bird caught Cambridge and Somerville off guard last summer, setting out dockless electric scooters on sidewalks for rent – without permission or any approval process. The cities responded with cease-and-desist letters. As Bird packed up its scooters, city officials began discussing how to regulate the scooters locally. But the conversation only went so far because of state law. In its first year, Bird pushed hard into 100+ cities around the world, surpassing 10 million rides, according to Wikipedia. Bird left Massachusetts last year, but it’s likely to return one way or another. The company has taken legal action against Beverly Hills and other communities with scooter bans. The industry is closely following the proposed legislation in Massachusetts. In addition to Bird, six other companies, including Lime, Uber and Lyft, have expressed interest, according to media reports. Scooters are the next step for rideshare and bike share companies (In fact, Bird was founded by a former Uber and Lyft executive; Lime counts Uber and Alphabet – Google’s parent company – as investors. And Uber and Lyft themselves are interested in their own right). Scooters are an affordable way to travel, with rides costing even less than subway fare. Anyone with a mobile phone can sign up and unlock a scooter for about $1.00; from there, the ride is about 15 cents per minute. Scooters may help alleviate some traffic congestion, but they will also increase pressure in many areas, such as Somerville and Cambridge, which have high counts of pedestrians and cyclists. Other states are seeing accidents and we will likely see more car accidents and truck accidents in Boston and across the state, regardless of the skill, leadership and collaboration local and state officials bring to the process. Although companies may mandate helmet use in the fine print, many people will end up riding without helmets. One important step will be educating drivers on how to travel near scooters and understand the scooter’s capabilities. Many drivers may expect blinker signals and will have to get used to the battery-operated motorized pace of scooters. Educating scooter riders is just as important. While motorcyclists have to study up and earn a special license, scooter riders can decide on a last-minute impulse to try a scooter. And when someone decides to take a scooter ride at the last minute, they are more likely to ride without a helmet. Helmets are not included in the rental, either. Before you consider riding a scooter, take time to plan. Keep a helmet at home and at work if there is a chance you may use a scooter. Take a class to learn how to ride in a safe area, such as an empty parking lot. Finally, ask your insurance agent if you have enough auto insurance should you be injured on a scooter. This is critical because the driver who hits you may not stop or may not have enough insurance to cover your injuries. Consumer Reports recently reported Bird and Lime, the two largest electric scooter companies, reported just 470 scooter accidents between the fall of 2017 and July 2018. Both California-based companies were founded in 2017. Consumer Reports conducted its own “spot tally” and found there were actually an estimated 1,500+ people were injured in e-scooter crashes (Source: “E-Scooter Ride-Share Industry Leaves Injuries and Angered Cities in its Path”). Consumer Reports surveyed 110 hospitals and five police departments or public agencies in 47 cities where at least one of the companies operated. Outside its survey, Consumer Reports at least 4 people have been killed on electric scooters, including a 21-year-old man in Austin, Texas on Feb. 2. The man was on his scooter, traveling in the wrong direction when a Uber driver changed lanes to exit and struck the man and his Lime scooter. An important note on the Consumer Reports survey: At this point, about 62 percent of the hospitals and agencies reported they had no scooter reports or they don’t track scooter injuries or they don’t have the capability to track injuries. A doctor in Bloomington, Ind. reported he treated serious injuries, included multiple concussions, facial fractures and bilateral forearm fractures. In some cases, patients required surgery for their electric scooter injuries. Another doctor estimated he had treated 20 patients after electric scooter crashes. Not one wore a helmet, except for his own son. Consumer Reports reported experts were concerned about the availability of helmets because not every rider carries a helmet or plans to use a bike rental (for its part, Bird told Consumer Reports it has given away 65,000 free bicycle helmets and strongly encourages helmet use). Consumer Reports is not the only one speaking up about electric scooter safety. 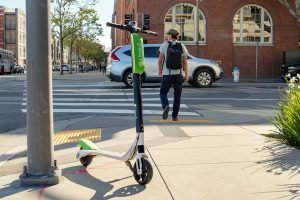 Last October, a class-action lawsuit was filed against Bird, Lime and other scooter companies. The lawsuit was filed in Los Angeles Super Court and alleged the companies were “aiding and abetting assault” by contributing to injuries sustained from collisions with scooters. Three of the eight initial plaintiffs said they were pedestrians who were hit from behind by scooters. One victim reported the scooter hit him and kept going. This was reported by L.A. Biz. Victims said the scooter companies were negligent because they should have known their vehicles would be a dangerous “public nuisance.” Bird and Lime were named, with the victims calling their safety instructions inadequate while the scooters themselves had mechanical issues. The complaint also claimed the companies have breached the warranties on the scooters and they are not suitable for repeated use by the public. The “dockless” part of scooters will also impact safety. Without the docks, riders can just leave scooters wherever they want, on the sidewalk or even on the side of the street. Fortunately, the Boston area already has some experience with bikeshares and dockless transportation. Blue Bikes offers bikeshare rentals in Boston, Cambridge, Somerville and Brookline. First arriving in Boston in 2011, the program now offers 2,500 bikes at 262 bike docks. Beyond these communities, the price tag of those bike docks have stalled the program’s growth. That’s where companies such as Ofo and Lime have stepped in with dockless rentals. Rather than pedaling to a dock, riders can lock bikes up wherever they choose. If another rider is in the area, they can find the bike on the company’s mobile app. The company is supposed to collect bikes at the end of the day. Ofo set up in Worcester and Quincy last year, then quickly retreated. The Metropolitan Area Planning Council (MAPC) chose Lime and Spin to provide dock-less bike share services in 15 communities last year. Spin later announced it was going to focus on electric scooter rentals, rather than bikes. Communities working with MAPC and Lime: Arlington, Bedford, Belmont, Chelsea, Everett, Malden, Medford, Melrose, Milton, Revere and Winthrop. A little farther west, Needham, Newton, Waltham and Watertown all participated. As for scooters, Boston, Cambridge, Somerville and Brookline are expected to operate a regional scooter system. We will have to wait and see on other communities. Our Boston personal injury lawyers have over 100 years combined experience representing individuals injured by car accidents and truck accidents in Massachusetts. If you have been injured, learn your rights for seeking compensation. Our attorneys have been recognized by Top 100 New England Super Lawyers, Top 100 Massachusetts Super Lawyers and Best Lawyers in America. We are here to help you. Free consultation: 800-379-1244 or 617-723-7676 or use our contact form.